This Antique Tile quilt block pattern was originally written for the Scrap Happy Sampler Quilt, but feel free to use the block to make a quilt of your own design. Antique Tile quilt blocks make wonderful scrap quilts, so grab your stash and look for the fabric you'll need to cut the patchwork. Mix up the fabrics as much as you like. The quilt block's patches are all cut along the fabric's straight grain, and that means it's a beginner-friendly design with very little stretch. Alter color and color value (contrast) to create blocks with a completely different appearance. Use a quarter inch seam allowance to assemble the quilt block. Sew the 2 1/2" wide burgundy strip lengthwise to the 2 1/2" wide gold strip. Press seam allowance towards the gold strip. Each strip should measure 2 1/4" wide along its entire length. Square up one end of the strip set and then cut four 2 1/2" segments from it. Sew the 2 1/2" wide green strip to the 2 1/2" wide light strip. Set the seam and then press the seam allowance towards the green strip. Individual strips should be the same width as the previous strips, 2 1/4". Square up one end of the strip set (don't remove very much if you're using strips that are just over 18" long). Cut four 4 1/2" segments from the strip (see green and light fabric segments in block mock-up at right). 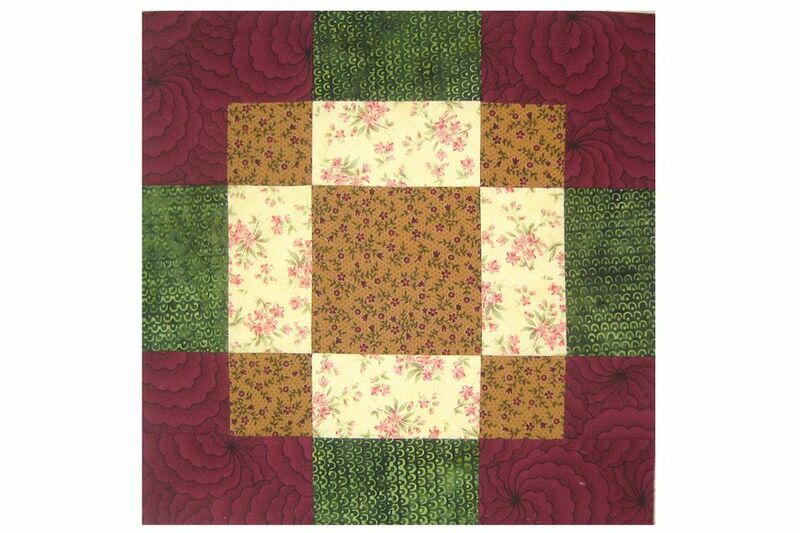 Arrange patchwork into three rows as shown in the block mock-up. Sew each corner section together – the 2 1/2" x 4 1/2" burgundy rectangles to the burgundy and gold segments. Press seam allowances away from the burgundy rectangles. Sew the components of each row together. Press new seam allowances in the top and bottom rows towards the center. Press seam allowances in the center row away from the center square. Join the rows, butting seam allowance lofts for a perfect match. Press. The block should measure 12 1/2" x 12 1/2".